here are a couple h380 and 2700 basically fill the case and put a bullet on. watch the case fill percent but it only goes to 50k with 107 percent so your not going to blow anything up with either and they will probably come close to cycling. Thanks BIGDAWG. Very nice of you. 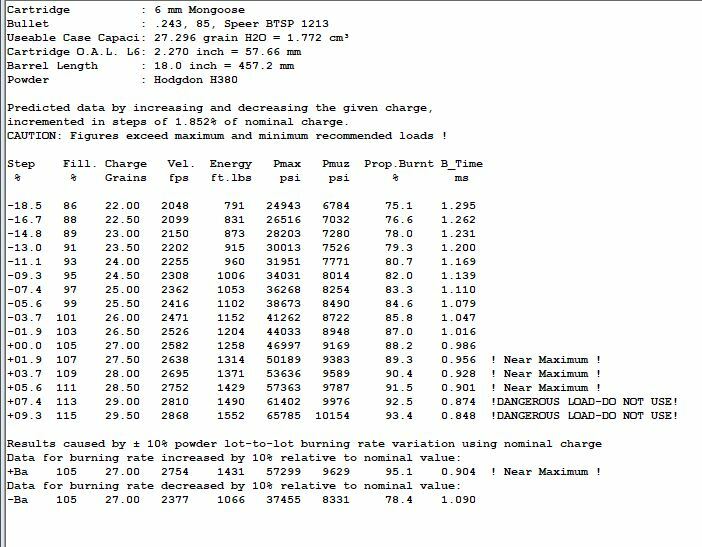 Looking at 6X45 Hodgdon data for H335 and 60gr bullets they list 27.5gr max. So, for fire forming my brass with 55gr Dogtowns I'm going to start test loads at 27gr and work up to an accuracy load. I'll probably set the OAL on those .6" shorties at 2.13 which seems to give me plenty of bullet in the neck for adequate neck tension. My best loads with 90gr FMJs in my old 6x45 was from W748, which is somewhere between TAC & X-Term in speed. It (748) is just a bit bulky for trying to max-pack Mongoose size cases. I have a limited supply of "slower" powders, however, I picked up some WC844 recently and, based on my 20 Viper trials, it may just be the ticket. BTW....just on the edge of compression. (Don't worry, I already have a drop tube if it comes to it!) Ideally, I would like to achieve a good hunting load meeting the velocity and accuracy thresholds. I know it will probably end up on the ragged edge, however, I don't plan on reusing the brass. In theory, WC844, H-335, W-748, TAC, and BL-C2 are "supposed" to be very similar in speed. It sure is worth a try. About a month ago I had the chance to test out the 90 gr. Nos BT (Accubonds shorter twin) in my custom 21.375" mongoose. Ok, not really custom, Biggdawg lopped off the threaded section of a 22" barrel and made a recessed target crown for me. I used TAC as well. Clean bore, a couple foulers, then testing. 2900 fps was doable out of my barrel, but I suspect you'd really have to be pushing it to achieve those velocities (and probably not get acceptable case life) out of a 20" tube. I'd be curious to see what the mil surplus powder does. Keep us informed. You will find WC844 is virtually identical to H335. I compared the two with identical loadings for my 6.8/27GPC and saw non difference in POI or accuracy. Then I bought an additional 16# and split it with a friend when American Reloading had a 15% off sale. I use it for 22 Nosler, 5.56, 6.5 Grendel, 27GPC, 308 and 260 Remington and plan on using it in my new Mongoose with 55gr Dogtowns for fire forming and hunting load development with heavier bullets afterward. At A.R. the stuff is damn cheap, shipped free and no hazmat. My kind of place. I also bought WC-846 (BL-C (2) equivalent) from them. Great powder as well. Used that for my 165gr Elk loads in my 308 AR10 last year that resulted in a dead cow Elk. Hmm - American Reloading? That's one I never looked into/dealt with. I'll check them out - thanks! Sometimes they have good deals on pulled, primed 6.8 brass, 5.56 brass etc. Also bullets from time to time. But, by far, the best deals are on the powder. If you pour the WC powders on the bench and compare to what they say they are equivalent to you'll never tell the difference. I've also not seen any difference in performance from H335 and BL-C(2). 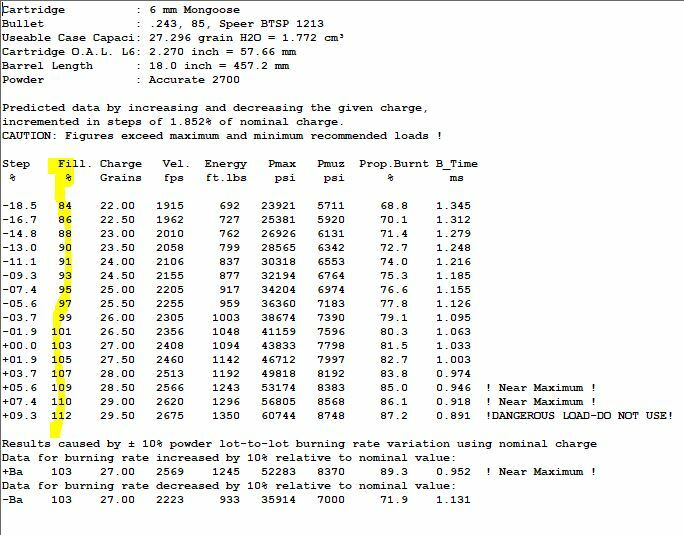 Of course to be sure I absolutely stepped up from a bit lower to begin with but, in the end, my charges ended up the same where performance was the same. The prices? Well, $244.99 for 16# of H335 shipped is tough to beat. But hold off for a bit on buying. Every so often they have 5-15% off sales on those already low prices. That last 16# I bought I got for $208.25 shipped. I picked up 16lb of WC844 for $202 shipped during their last sale. When I tried it in the Viper (see thread) it ran about 0.5 grains slower than my H335 loadings. They state that every lot varies so it behooves you to ladder different lots. From time to time they have 6mm 95 Fusion pulls in stock and IMO, they are tough to beat as a Mongoose deer bullet. For example, my 95 Fusion/TAC loading @ 80 F yields 2790 fps and today was only 2678 fps. If I take the liberty of considering the temperature/velocity variance as linear, I could assume an anticipated velocity of ~ 2900 with the 27.1 loading. American Reloading has a 17% off sale going on for the H335 and BL-C (2) equivalent WC powders right now! Use code madness17 at checkout. Got to get out and shoot today-Tupelo, MS weather 72-78 deg. Partly cloudy-calm to light breeze. Just more data for you guys. Goose ran great. 8T20” 3 lb velocity trigger. 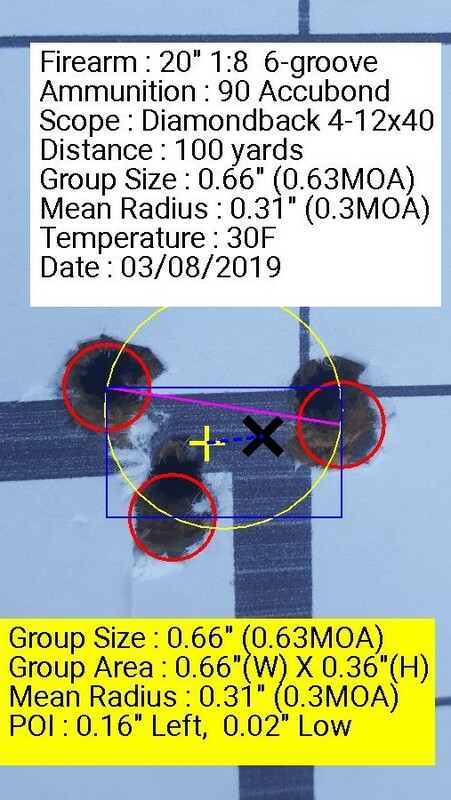 Wow - that 10-shot group with 24.0gr BenchMark (center target, 3rd page) sure looks excellent! !